Definition at line 25 of file CLRadialGradient.h. Definition at line 26 of file CLRadialGradient.cpp. References CKeyFactory::add(), CCopasiRootContainer::getKeyFactory(), and CLGradientBase::mKey. Definition at line 42 of file CLRadialGradient.cpp. Definition at line 58 of file CLRadialGradient.cpp. Returns the x coordinate for the center point. Definition at line 122 of file CLRadialGradient.cpp. Referenced by CLLayoutRenderer::create_radial_gradient_texture(), getRadialGradient(), CCopasiXML::saveRadialGradient(), and toSBML(). Definition at line 178 of file CLRadialGradient.cpp. Returns the y coordinate for the center point. Definition at line 130 of file CLRadialGradient.cpp. Definition at line 186 of file CLRadialGradient.cpp. Returns the z coordinate for the center point. Definition at line 138 of file CLRadialGradient.cpp. Referenced by CCopasiXML::saveRadialGradient(), and toSBML(). Definition at line 194 of file CLRadialGradient.cpp. Returns the x coordinate for the focal point. Definition at line 146 of file CLRadialGradient.cpp. Definition at line 202 of file CLRadialGradient.cpp. Definition at line 154 of file CLRadialGradient.cpp. Definition at line 210 of file CLRadialGradient.cpp. Definition at line 162 of file CLRadialGradient.cpp. Definition at line 218 of file CLRadialGradient.cpp. Definition at line 170 of file CLRadialGradient.cpp. Definition at line 226 of file CLRadialGradient.cpp. Sets the coordinates for the first point. Definition at line 94 of file CLRadialGradient.cpp. References mCX, mCY, and mCZ. Referenced by setCoordinates(), and CCopasiXMLParser::RadialGradientElement::start(). Sets the 3D coordinates for the center and the focal point as well as the radius. Definition at line 75 of file CLRadialGradient.cpp. References setCenter(), setFocalPoint(), and setRadius(). Sets the 2D coordinates for center and the focal point as well as the radius. Definition at line 86 of file CLRadialGradient.cpp. Sets the coordinates for the second point. 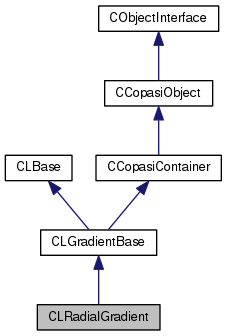 Definition at line 104 of file CLRadialGradient.cpp. References mFX, mFY, and mFZ. Definition at line 114 of file CLRadialGradient.cpp. Definition at line 234 of file CLRadialGradient.cpp. References CLGradientBase::addSBMLAttributes(), getCenterX(), getCenterY(), getCenterZ(), getFocalPointX(), getFocalPointY(), getFocalPointZ(), getRadius(), and CLRelAbsVector::toSBML(). Definition at line 32 of file CLRadialGradient.h. Referenced by getCenterX(), and setCenter(). Definition at line 33 of file CLRadialGradient.h. Referenced by getCenterY(), and setCenter(). Definition at line 34 of file CLRadialGradient.h. Referenced by getCenterZ(), and setCenter(). Definition at line 36 of file CLRadialGradient.h. Referenced by getFocalPointX(), and setFocalPoint(). Definition at line 37 of file CLRadialGradient.h. Referenced by getFocalPointY(), and setFocalPoint(). Definition at line 38 of file CLRadialGradient.h. Referenced by getFocalPointZ(), and setFocalPoint(). Definition at line 35 of file CLRadialGradient.h. Referenced by getRadius(), and setRadius().